The design provides a balanced (XLR) stereo output, and 6 selectable inputs of which 2 (or 3) are balanced inputs and 4 (or 3) are single-ended (cinch) inputs. Balanced cabling towards the power amplifier in principle provides cleaner audio signal transfer. Audio volume control and stereo balance control is implemented through a series of relays, 6 per channel, providing 64 volume steps of 1dB with high quality and reliability, beyond what can be obtained with other types of volume controllers. Besides through a single front knob, the pre-amplifier can be remotely controlled through IR signals. It supports multiple IR protocols, to provide large freedom in remote controller selection. 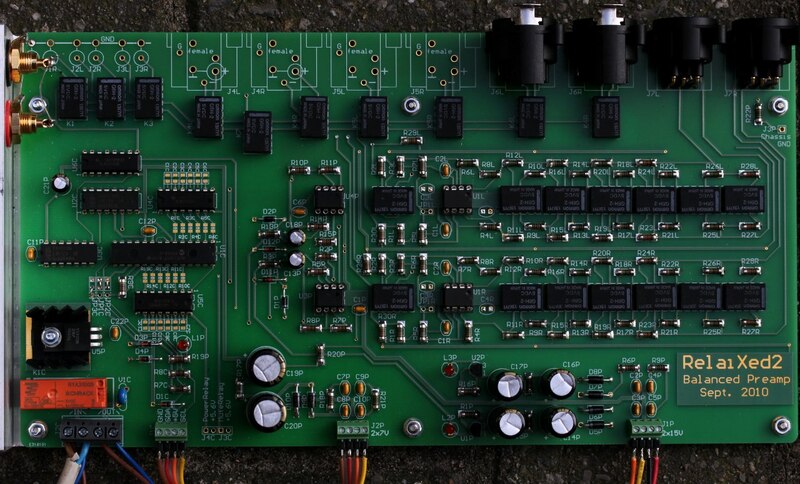 The hardware design entails a larger PCB containing the audio processing, the power supplies, some digital decoding, and the on-board XLR connectors, and is to be placed against the back-plate of the pre-amplifier chassis. Next to that, a small front-PCB contains the microcontroller, a 2-digit LED display, and the IR receiver, and is to be located against the front-plate of the pre-amplifier. The software ('firmware') of the embedded microcontroller can be easily updated through a USB connector. All embedded software as well as the PC interface software is made public available. 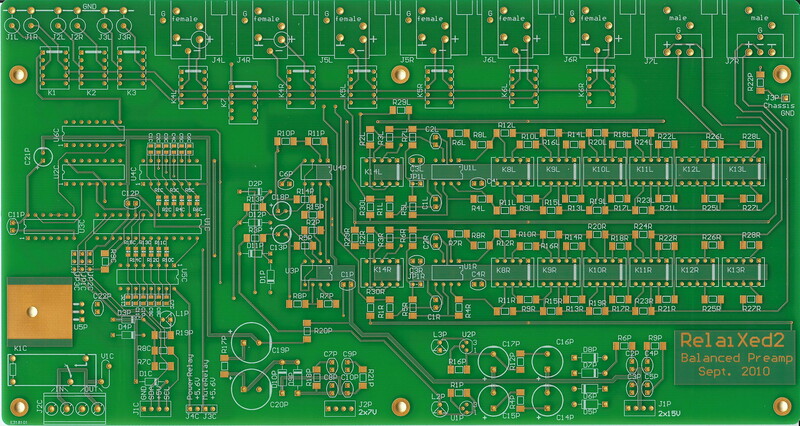 Upon request I provide the PCBs to other audio hobbyists, as well as the required pre-programmed microcontroller. These PCBs are being made with first-grade industrial quality, two-layer through-hole, and gold finishing. For all other components I provide a component table with order-numbers for a well-known internet shop. Note that I will not freely provide the PCB design files. The relay-based attenuator in this RelaiXed (and in the new passive attenuator) differ from my older designs, and most designs offered elsewhere, in improvements to avoid audible signal spikes in the audio signal due to relay switches. These improvements are in: special milli-second based timing of the relay state transitions, avoiding steep voltage transients on the relay coils, and ground shielding in the PCB layout. A little sister with almost the same design, but a more compact implementation based on SMD components. New as of September 2014: A passive attenuator, handling plain (single-ended, cinch) audio. This will finally replace my original attenuator on which I have received so many messages. The original drive to create the RelaiXed was to provide a high-quality DIY pre-amplifier with balanced inputs/outputs, for which there were very few choices available. The RelaiXed combines with several available power amplifiers that benefit from balanced signals, such as the DIY PassLabs mosfet amplifiers such as this Aleph-X, the Hypex amplifier modules such as their UcD400HG, and Holtom precision amplifiers such as their HPA_nxV300 R2. The hardware design files with schematics and PCB layout with sizes: design_20120128.pdf. The User Manual 2013-06-01, with basic performance measurements, build instructions and fotos, and operating guide. The HW Design Manual, with motivation and explanation on the schematcs, and more detailled measurements, indented to be readable for persons with some electronics background. Component list and prices: Component table. with component type and price info from Mouser. A zip file with datasheets of all electronic components used in the design. A SW Design manual explaining the organization of and build process for the embedded software as well as for the PC-side interface software. The online software project, that provides all source code in a revision control system (svn), also in a web-browsable format. If you want to contribute to improving/extending this software, please contact me. You might want to check some performance characteristics, which are listed in the page on the SMD version. New of July 2014: Added distortion measurement. It fixes an old bug that caused the IR reception to block sometimes after a power-up. It makes the Relaixed to power-up from standby at a 'press' of the knob, instead of at its release. It uses an audio mute during a fraction of a second when switching from input channel. This helps prevent a strong 'tick' when switching inputs at high volume. Upon request (by email) I can send PCBs and preprogrammed microcontrollers. NEW from Apr 25: with a new set of PCBs made, I can do a slight price reduction. A pair of PCBs now costs €72,=. The preprogrammed PIC18F24J50-I/P microcontroller costs €8,=. Packaging and mailing with a sign-on-receipt delivery service costs €13,= throughout Europe, and €18,= elsewhere. Additionally, there is some support for creating a RelaiXed cabinet. Do not use more semiconductors in the audio path then needed. More semiconductors easily make the sound less open and transparent. For those semiconductors that remain, use quality types that are designed for high bandwidth. I suspect the non-linear (parasitic) capacitances inside the semiconductors. In devices that support high-frequency operation these capacitances have lower (less disturbing) values. Otherwise, the nonlinearity of these capacitances can be reduced by operating the design at relatively high supply voltages. Always choose good quality components! Nevertheless, I often find the advertised/dedicated 'high end audio' components over-priced, and instead look for first-grade professional (industrial) types. In general it is good to look for low-noise components. Low noise often correlates with good production quality. The resistor type and brand in this design is chosen for its excellent noise specification of 0.01uV/Volt, at a very afforable price (compared 'high end audio' resistors). The relais + resistor attenuator avoids the weak contacts of a sliding potentio-meter, and avoids the single-chip digital controlled integrated attenuators (as I distrust most semiconductors). Some theory on the operation of the switched attenuator got described in a wikipedia page. The on-board XLR connectors provide a short and good-quality connection to the audio electronics, without you having to worry about wiring audio inside your chassis. No audio signals are routed to the front (display) module. The digital electronics on the main (relay-) PCB are 'silent' during normal use: the digital signals do not switch state, there is not a 'life' clock signal. This prevents interference from the digital side into your precious analog audio signals. Only during volume- or channel-changes there is a moment of digital activity. The digital circuit is strongly separated from the audio, there is not even a common ground signal. Some extra firmware control to choose and fix relative volumes per input channel. This way, switching between input channels would retain a more uniform sound level. Support a separate (alpha-numeric or graphic) LCD display as alternative to the basic 2-digit LED display. When connected through I2C, this would require a software extension only. I am currently (September 2014) experimenting with this OLED display.